Our sales awards collection is hand-curated by our recognition professionals to bring together the best symbols of achievement. Recognize the employees that bring in new revenue and strengthen your business, and show your appreciation for their contributions to your success. This elegant 1/2" thick acrylic is cut and beveled to a unique octagon shape. The gold mirrored base catches light to reflect up through the clear acylic for a stunning affect. 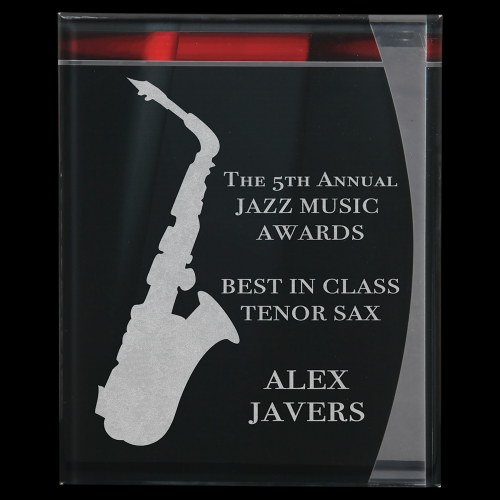 Available in 3 colors and 3 sizes, it offers value and variety for your award needs. 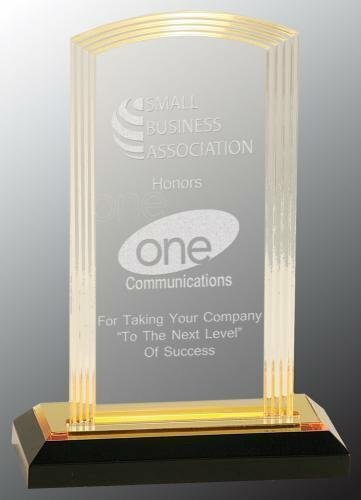 Simple, stunning, and elegant describes this acrylic award. The substantial rectangle block is slanted at the top and angles to a peak with cuts and bevels that create a rippling wave affect. The strip of gold color at the bottom reflects up through the piece to catch the waves, providing a beautiful frame of color to the large personalization area. 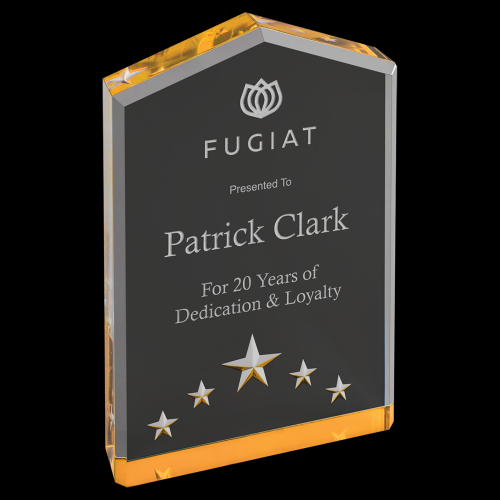 Available in two sizes and 3 colors, this piece offers several options for recognition of achievement. 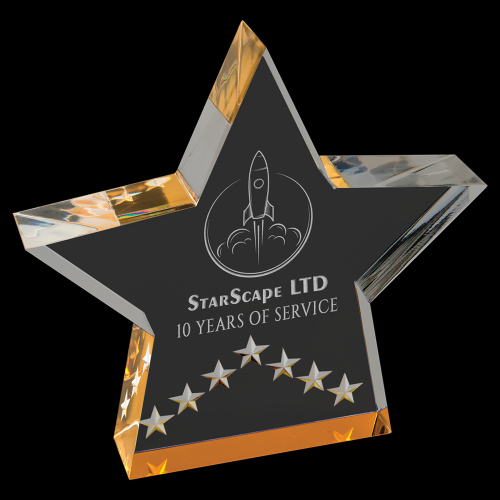 3" x 8" x 1-7/8"
3-1/2" x 9" x 1-7/8"
Recognize the star performers of your company, organization or school with this fun 1" thick star shaped self standing award. Flat at the bottom, the star design is completed by the stars cut into the acrylic. Strips of gold catch the light and reflect color throughout the star for a brilliant affect. 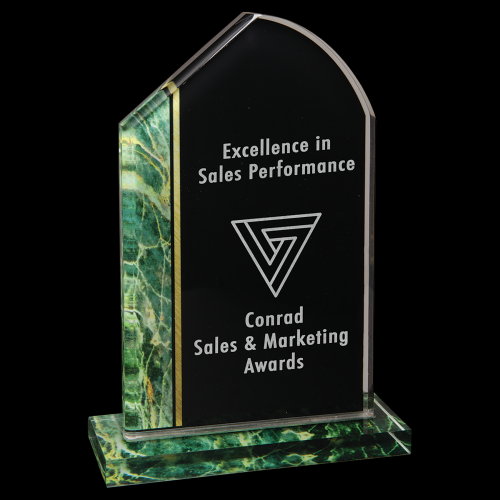 Available in 2 sizes and 3 colors it offers multiple options for your award needs. 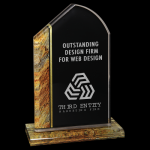 This regal looking acrylic award is 1" thick and free standing. The slanted top is mimicked at the bottom by stars cut into the acrylic, and gold strips at the top and bottom catch the light and reflect up through the piece for a stunning visual affect. Available in 3 sizes and 3 colors and with plenty of room to personalize, you have lot's of options for rewarding your star performers. The multiple facets that surround the refined arch design reflect the color from the top of the base up through the clear acrylic, creating highlights in this conservative award design. The black acrylic base provides a sturdy and elegant foundation for the large personalization area. 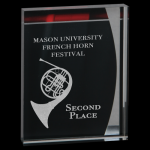 Polished acrylic offers value in a splendid award design. The unique shape of this 3/4" thick stand up acrylic is only a part of what makes it so visually appealing. The large black personalization area is framed in gold, and the exquisite gold autumn like hues of the base and along one side highlight the personalization. The contrast of the splash of color next to the stark black creates a modern, elegant award. 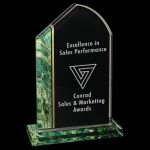 The Tuscany acrylic is available in 5 colors and 2 sizes to meet your recognition award needs. The unique shape of this 3/4" thick stand up acrylic is only a part of what makes it so visually appealing. The large black personalization area is framed in gold, and the exquisite green art design of the base and along one side highlights the personalization. The contrast of the splash of color next to the stark black creates a modern, elegant award. 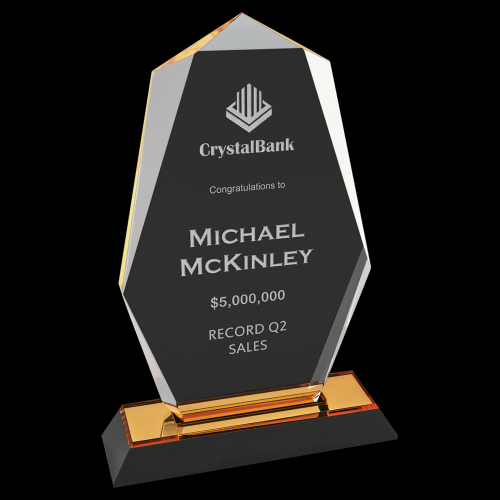 The Tuscany acrylic is available in 5 colors and 2 sizes to meet your recognition award needs. 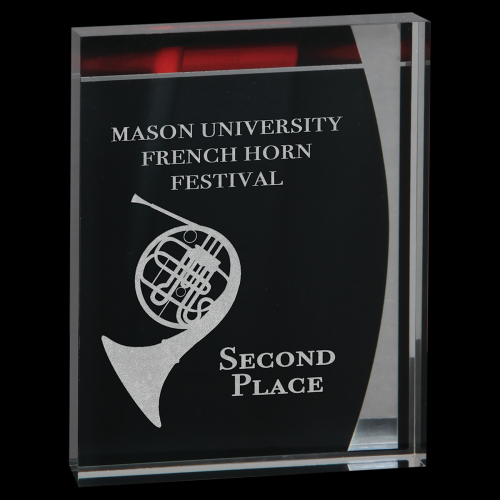 Simple elegance with a modern flair is a good description for this 3/4" thick black acrylic plaque. A ribbon of silver framing one side, and a red and silver bar across the top or bottom of the plaque highlight a large personalization area while adding dimensionality and visual interest. A white self adhesive backer shows through to enhance the personalization and allows for either vertical or horizontal hanging. 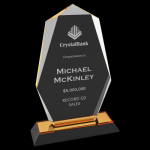 Available in 2 sizes, your recipient will be honored to receive this recognition of accomplishment. 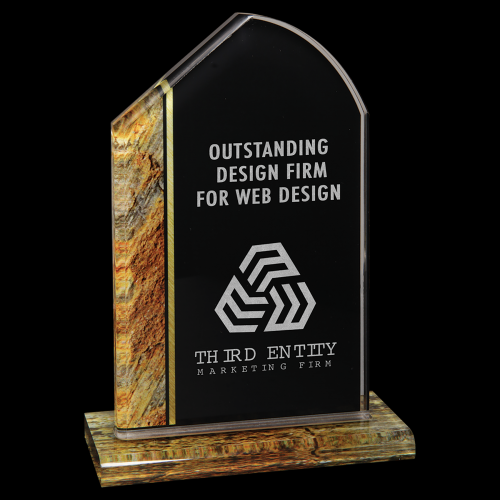 Simple elegance with a modern flair is a good description for this 1" thick black acrylic stand-up. A ribbon of silver framing one side, and a red and silver bar across the top acrylic highlight a large personalization area while adding dimensionality and visual interest. 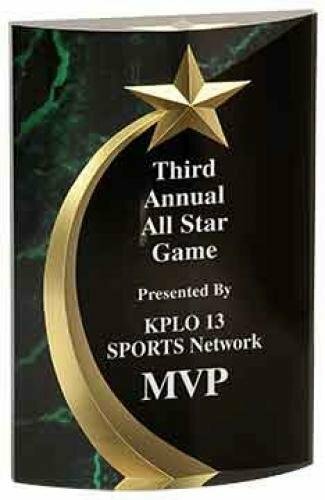 Available in 2 sizes, your recipient will be honored to receive this recognition of accomplishment.